I agree that there’s some false advertising in the title. First, I admit that many of my choices are books written before Christ was born; second, that they are purely subjectively the best. Really, what we’re looking at here is my reading habits. These are the books that I liked best in 2015. I’ll start with the most brilliant novel I’ve read in a long time… perhaps ever, and certainly within easy memory. It is Elena Ferrante‘s ‘My Brilliant Friend’ (not pictured) and the second volume ‘The Story of a New Name.’ Now, as I mostly write about military history, I have to assume that most of the folks who read my blog love military history, so I need to offer the following disclaimer. In the whole of Elena Ferrente, there is not a shred of military history. The truth is that almost anything I say about these novels will cause many of my readers (and my friends) to run screaming… the story of two girls growing to become women in post-war Naples Italy; the story of the birth of Marxist political consciousness; the story of a woman learning to write, to express herself, to think, to read, all in the shadow of her brilliant friend. No, that still doesn’t do justice. It’s meticulously plotted, brilliantly paced, magnificently detailed. And there isn’t a single sword fight. OK, I’m done. But it was, and will remain, my number one. Yeah. In the end, I was a little breathless, and I’m damn glad the Brutis and Brunis, the protagonists, lived a century later than Tom Swan. Anyway, you may shy off from my love of Ms. Ferrante, but you can’t refuse to read this. History is almost always better than fiction. I’m glad the Queen gave this man a knighthood. 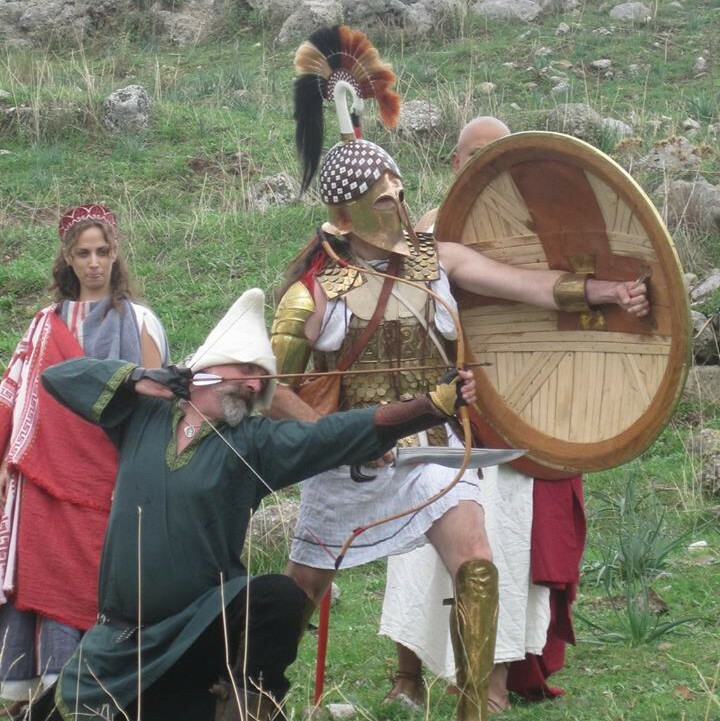 Above… Nicos Lanser telling us about the ‘Treasurey of Atreus’ at Mycenae on the Pen and Sword Tour. Shameless plug. After these two works that inspired awe and perhaps a little terror (I’ll never do research as well as Malcolm, or write as well as Ferrante) I’ll list the rest of my favorites in no particular order. Pausanius. Yes, Pausanius, and his ‘Description of Greece.’ I rediscovered Pausanius this year in Greece on the Pen and Sword tour. Our awesome guide, Nicolas Lanser, read aloud from Pausanius and as I had my copy with, I started reading ahead. I lost almost a whole day on the bus, reading about Philopoeman, (this should not be news, but SJA Turney and I are planning to write… I already told you that? OK. Think of this as advertising, then. Writing a book on Philopoeman and another on Flavininus as parallel lives. Right? OK.) And Pausanius saw all the great sites as still-active, working institutions. He was in the Ancient world, touring it for us. You don’t have to read it all at once. But on a tour bus, traveling across Greece… it’s magical. And inspiring. While I’m visiting the ancient world, let’s mention my new best friend, Polybius. Yes, I admit it… I made it to age fifty-three with only a scan of Polybius, and that was probably just stuff on the Roman Army I needed for a wargame. In fact, he was a great writer; his fluent Greek comes across even to me (and my Classical Greek is not that good) and his prose translates beautifully into English. His introductory paragraphs on what History should be are brilliant, and every single person should read them and hold all histories accountable. …..it has always seemed to me that men, who are persuaded that they get a competent view of universal from episodical history, are very like persons who should see the limbs of some body, which had once been living and beautiful, scattered and remote; and should imagine that to be quite as good as actually beholding the activity and beauty of the living creature itself. But if some one could there and then reconstruct the animal once more, in the perfection of its beauty and the charm of its vitality, and could display it to the same people, they would beyond doubt confess that they had been far from conceiving the truth, and had been little better than dreamers. For indeed some idea of a whole may be got from a part, but an accurate knowledge and clear comprehension cannot. Wherefore we must conclude that episodical history contributes exceedingly little to the familiar knowledge and secure grasp of universal history. While it is only by the combination and comparison of the separate parts of the whole,—by observing their likeness and their difference,—that a man can attain his object: can obtain a view at once clear and complete; and thus secure both the profit and the delight of History. What makes Polybius great was that he was there; he knew many of the players; he was a small player himself; and he was self-aware enough to allow some measure of his own bias. I wish he’d lingered to write about some other periods, as well. In Polybius, I found why so many of my friends and fellow HisFic writers have a passion for this period. I understand Ben Kane‘s Carthaginian series better (and his passion for the period), and many others. In fact, I’m not sure there’s a secondary source in period as good as Polybius. Next, another historical volume; a sort of survey of the role of printing int he History of Venice called ‘Bound in Venice’ and translated from Italian. This was recommended to me by a friend at a local coffee shop… I’ve never regretted it. I agree that it’s the sort of episodic history that Polybius decries above, but… heck… I don’t have to be consistent, do I? it was a pleasure opt read, and elements from it will doubtless crop up in Tom Swan and perhaps other projects, secret or otherwise. He was my kind of nutter, and spent the declining years of his life in total poverty so that he could build accurate scale models of dozens (hundreds?) of bark canoes before their styles and construction were forever lost. How cool is that? Beautiful pictures. Inspiring stuff… I guarantee elements of this book will find their way into Fall of Dragons (traitorson Book 5). Well, that was a long rant. However, I’ve done you all a favour. Go read and enjoy. Oh, buy my books too. And Matt Heppe‘s new fantasy novel, Shadow of the Knight! ” A foolish consistency is the hobgoblin of a small mind” Waldo Emeson. Are there specific translations of Polybius and Pausanius you’ve found to be good. The Loeb edition of Polybius certainly gives the Greek but almost certainly not the best English translation for the modern ear.